Since 2007, Beatrice Blake and her Salvadoran colleagues have been developing a practice to foster resilience and well-being in El Salvador, a country that is trying to build democratic institutions while dealing with poverty, gang violence and the aftermath of its 12-year civil war. 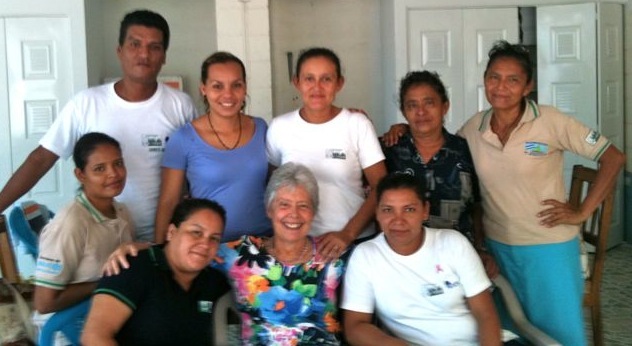 Working through already existing community organizations, Focusing El Salvador teaches Focusing and Empathic Communication, providing a safe place where people can get in touch with their inner resources for healing, growth and interpersonal communication. Our trainings, called Generating a Culture of Peace, empower people to reduce stress and depression, to find new ways to address conflict, and to open doors to creative thinking. Several Salvadorans who work with underserved populations would like to become Focusing trainers. We need to raise funds to continue training for these dedicated community workers. “When we have a turbulent situation, pausing and listening without judging helps me prevent disproportionate and violent reactions with the people around me. “Now there are less crises when something doesn’t turn out as expected. The Pause helps take the power out of emotions and lets me think of healthy solutions, by listening to myself and other people.